Blaze™ carries out biologically relevant virtual screens of large chemical databases. It uses the electrostatic character and shape of known ligands to rapidly search large chemical collections for molecules with similar properties. Achieve substantial improvements in the properties of your hits. Blaze has been delivering lead-like hits to our customers for over a decade. They have achieved hit rates as high as 30%, but what they really value is the diversity of hits returned from every Blaze screen. See case studies for a range of examples. Engage Cresset Discovery Services to carry out a virtual screening project. Blaze Cloud provides the ability to search millions of commercially available compounds using an encrypted web browser session. It brings you all the power of Cresset’s cutting edge technology, while providing extremely high value by ensuring you pay for only what you need. 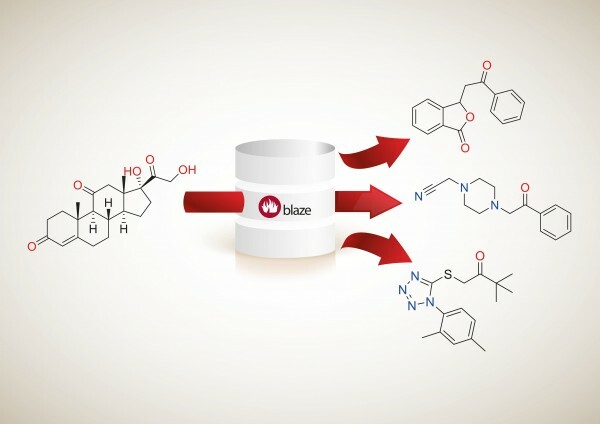 If you have strong computational chemistry expertise but lack computing power, using Blaze Cloud on a per-project basis provides a flexible, secure, high value solution. The per-project usage has an added benefit for contract research organizations in that product usage becomes a consumable, which simplifies the process of billing clients. Using Blaze Cloud is extremely cost effective, flexible and secure. How does Blaze Cloud work? When you use Blaze Cloud you’ll be given access through your own secure, Cresset-hosted portal, which will only exist while you need it to ensure the security of your proprietary data. You can run searches for your project within the cloud infrastructure and access the software for as long as you need to complete your project. You will be able to generate an unlimited number of hits, and the extremely high hardware cap is unlikely to affect most users. We’ll store your results for up to two full years, so you can always come back to your results later if needed. Projects can also be completed using a portable cluster if preferred. Blaze Cloud includes access from KNIME. The new Blaze Cloud demo server demonstrates the simplicity of a Blaze virtual screening experiment. The demo server is fully functional, enabling you to see the simplicity of the Blaze software for searching a small collection of compounds using the standard search cascades or managing compound collections. Blaze is remarkable easy to use but should you require advice then the software comes with a full manual and context sensitive help on every page. You are welcome to use it from a web browser or using the REST interface. Register here for your username and password. The shift to parallel computing has allowed us to use a single workstation containing four consumer GPUs as a replacement for a 40-node quad-core CPU cluster. Virtual screening is being hailed by some as a superior method of evaluating compounds compared to high throughput screening. However, it’s still important to choose wisely between a ligand or protein based model template. Scaffold hopping and virtual screening are effective and efficient ways to identify a new series to move the project forward. See recent news and blog posts about Blaze.